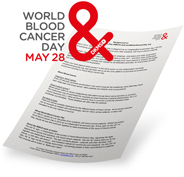 Here you can find all you need to prepare for World Blood Cancer Day, from press material, to the WBCD logo and posters for your event. Just click on the links below and the download will start automatically! We have compiled some general information about World Blood Cancer Day for journalists and editors here. Just click on the button below and the download of the document will start automatically. The red “&” sign, or ampersand, is the symbol of World Blood Cancer Day, signaling the fight against blood cancer and solidarity with blood cancer patients. By clicking on the image you can download the official WBCD logo and make your mark! You can also support WBCD and make your mark against blood cancer in your social networks! For example, you can exchange the cover photo on your Facebook profile or post one of our WBCD visuals. We have prepared a small folder containing a couple of useful visuals – just click on the image and the download will start automatically. Here you can download flyers and posters promoting World Blood Cancer Day. Just click on the image and the download will start automatically, providing you with a folder that contains various files. You can print these documents yourself and distribute them in your home town, at school or at work!